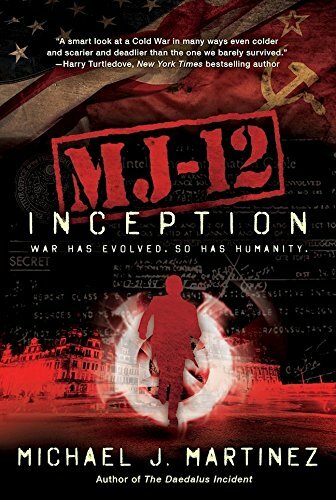 MJ-12: Inception is an alternate history sci-fi thriller involving a group of people who have been given super powers by an anomaly created in the aftermath of the Hiroshima bombing at the end of World War 2. These “Variants” – as they are called throughout the book – are recruited by the American government into a program known as the Majestic 12. Their goal: be an extra force for the United States Intelligence and Military communities. Naturally, things just get more complicated from there as Cold War tensions and former Nazi scientists are woven into the story. It’s really quite something. This was quite a surprise. I’ve been familiar with the general lore of the Majestic 12 UFO conspiracy for a few years, and when I saw this book, I was immediately intrigued by the title. Obviously, just by reading the summary, it’s clear that this book has very little to do with the Majestic 12 mentioned in UFO conspiracy circles. But that’s one of this book’s greatest strengths. I expected this book to be like the Transformers film, but in novel form. I expected a mindless summer blockbuster style thriller. But what I got was something better. If we’re going to continue using the analogy of movies here, MJ-12: Inception is closer to a Marvel movie than a Transformers film. It’s very much still an action-thriller, but there’s a lot of time and care spent developing the characters and their involvement and chemistry with each other. You’d think a story that’s basically sold as “what if the X-Men were spies?” wouldn’t bother to actually have depth, but you’d be wrong. There’s a lot of depth. One of the characters, Cal, repeatedly questions the morality of what he’s being asked to do. He spends great deals of time trying to rectify his potentially destructive powers and his Christian faith. Another character, Maggie, allows herself to get swept up and consumed by her powers, leading other characters to question whether or not this is a wise or safe move. It’s little touches like that that make this book stand out and become something better than the pulpy story it looked like it would be. I really can’t emphasize just how surprised I was by this. I thoroughly enjoyed it. If you’re a fan of spy novels, thrillers, superheroes, or alternate histories, you should definitely check this book out. Be warned, it’s the first of a series – and it ends on a cliffhanger. Not a terrible one, the main plot is wrapped up in the novel, but there are some teasers left that will make waiting for the sequel (coming out in September) difficult. Color me excited for more of these books! Kudos, Michael J. Martinez. You hit this one out of the park.